Zarefsky, David. Public Speaking: Strategies for Success (5th Edition). Allyn & Bacon, 2007. Dannels, D.P. (2002). Public Speaking Student Handbook. Dubuque, Iowa: Kendall Hunt. Note: If you purchase the 4th edition of the Zaresky book, your chapter numbers won't quite mesh up with the ones on this syllabus. You can translate to the proper chapters in your book using this table of contents to the fifth edition. Find the chapter number on the schedule, check for that chapter's title using the provided table of contents from the fifth edition, and then find the corresponding chapter in your edition. This course is designed to improve your public speaking abilities by developing your use of critical thinking, research, preparation, practice, and feedback. The primary commitment of this course is to provide you with numerous opportunities to practice, and receive feedback on, your public speaking skills. This is a performance-based course; you will be expected to engage in several public speaking events to learn critical listening skills, and to employ those skills by providing feedback to classmates when they speak. 1. Communicate effectively in specific writing or speaking situations, which may include various academic, professional, or civic situations. 2. Understand and respond appropriately to the critical elements that shape communication situations, such as audience purpose, and genre. 3. Critique their own writing or speaking and provide effective and useful feedback to enable other students to improve their writing or speaking. 4. Demonstrate critical and evaluative thinking skills in locating, analyzing, synthesizing, and using information in writing or speaking activities. Note that assignment and grade weights can be found in your handbook. If for any reason you exceed four (4) absences and you have excused absences, you will need to provide your instructor excuses for each of your five or more missed days. At this point, any unexcused absences remaining may immediately cause your final grade to be assessed penalties, and even four excused absences may have grade consequences to be determined on a case-by-case basis. Absences on any day that speeches are being given may result in a grade penalty. You are expected to attend, listen to, and provide feedback on the speeches of your peers. If you have an excused absence on a speech day, you will be assigned a day to make up that speech. 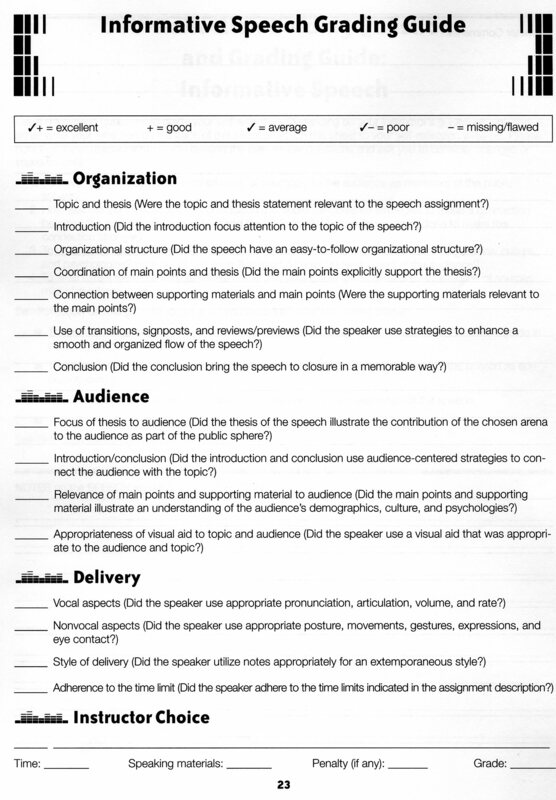 If you miss a second speech or the make-up day for any reason, you may receive a 0 for each speech that is not given. Please ensure that you leave cell phones off and out of sight during class. If you receive a call during class or receive (or send) texts or other messages, your instructor reserves the right ot confiscate the item for the class period and freely communicate with whomever is on the other end of the line. Your instructor will not be responsible for charges incurred during this communication, nor will the University or its affiliates. You solely will be responsible for those charges. For your speech drafts, you need to record yourself using a webcam or video camcorder. You may either email me (bailey dot teaching at gmail point com) files less than 8 megabytes, or you may upload the video to YouTube. I would recommend using iMovie '08 on the library's iMacs or MacBook Airs if you'd like to upload to YouTube, as it's very easy to do. You will find a tutorial at this URL. Though I'd prefer you left your videos public if -- and only if -- you're comfortable doing so, you are welcome to make the video private. If you do, please ensure that I'm listed as a contact who can view it. To do this, go to YouTube's My Videos page after logging in with your account. Select your video and click its "edit" link. Go to "Broadcasting and Sharing Options", ensure Private is selected, and add "rufwork@gmail.com" to your contact list. Let me know if you have any issues. Note that YouTube does date when you uploaded the video, so ensure each is up by the draft due dates. When drafts are listed in the syallabus, they will be expected. Though there will be a penalty for not completing a draft, the real emphasis is on giving you a chance to get more comfortable with and improve your speeches! Reviews of drafts will also be required, and review expectations will be discussed in class. Note: The schedule is subject to change. I will let you know if any changes are made. 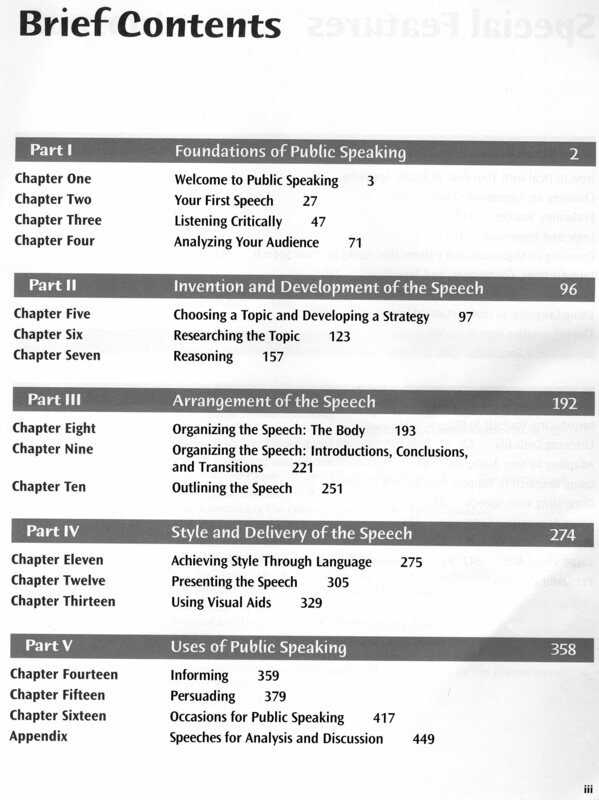 11 Class introductions Read Chapters 1 & 5 and Impromptu Speech materials from handbook (pp 5-16) for the next class period. Fill out and return the student information form on page xiii of your handbook. Bring in newspaper article an issue of local interest for our next class. 25 No class; instructor out of town. Today, the 25th, is the last day to add or drop a course with tuition adjustments. 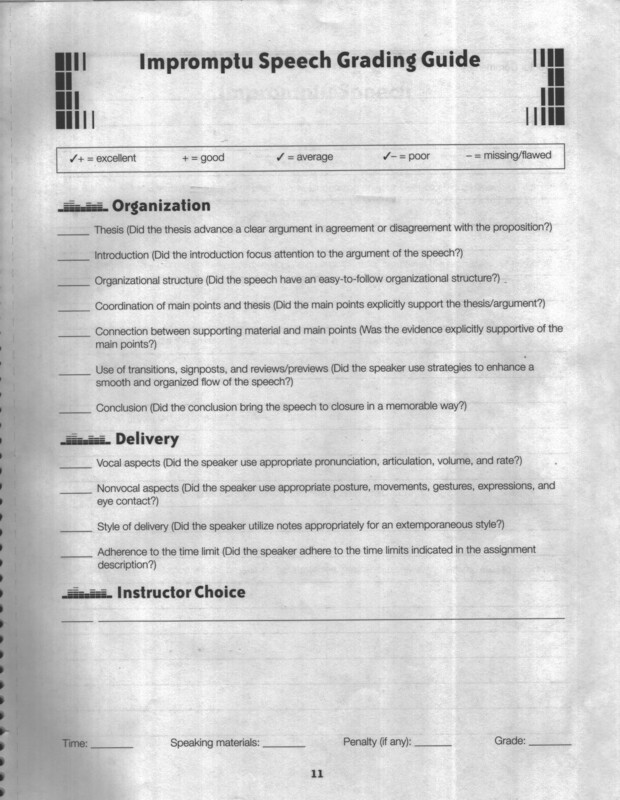 27 Speech practice Due today, Jan 27th: Successfully uploaded and accessible YouTube draft of a impromptu speech. Note: We will not be peer reviewing this draft; this is 1.) An opportunity for you to try out speaking for an "audience" and 2.) A quick check to make sure we're up to speed on YouTube. Video drafts are discussed here. Your topic will be taken from any story on the News and Observer's Opinion webpage from the same day that you upload your speech. Select from the opinion stories, letters, or "Other Views" sections, but not from the "Most Popular" or "Editors' Picks" sections, which are not exclusively editorials. 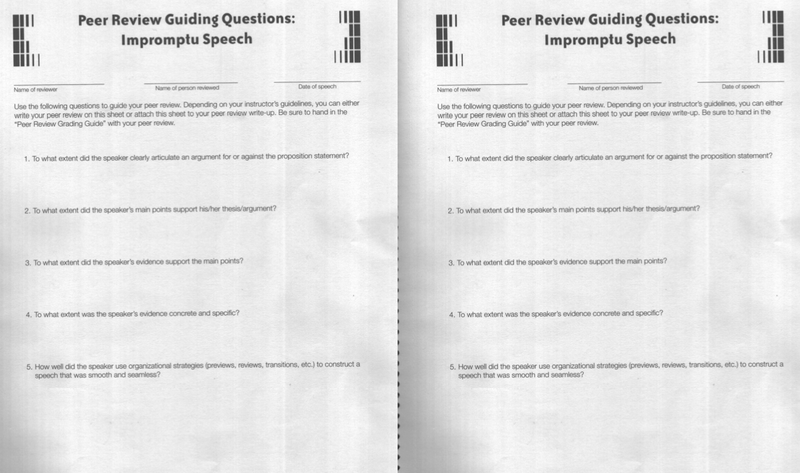 Informative Speech Peer Reviews Due Saturday, Feb 20th. Impromptu grades to be returned on the 18th. 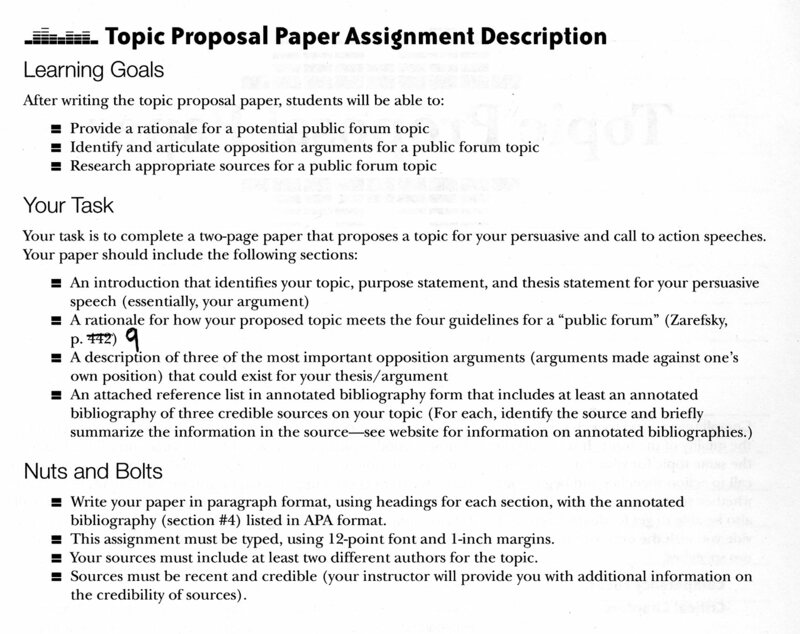 * In-class source review exercise * Draft your topic proposal papers and bring a printed copy on the 8th. * Watch an episode of Hoarders and try to think of the way what makes sense to one person doesn't always make sense to those around them! * .doc, .rtf, and .pdf are all acceptable formats. Do NOT use docx; save as pdf. * NOTE: Please use Times New Roman, 12pt for your font type and size. 24 Topic Propsal Revisions Due Friday, the 26th: Topic Propsal Revisions. * No printed copy required. Caldwell G108 (our regular classroom) Relax. You've done a good job. Caldwell G108 (our regular classroom) Relax (section 25 this time). You've done a good job too.